Stems herbaceous, smooth, slender, 1 to 2 feet high from a perennial root, usually much branched and with several barren shoots at the base. 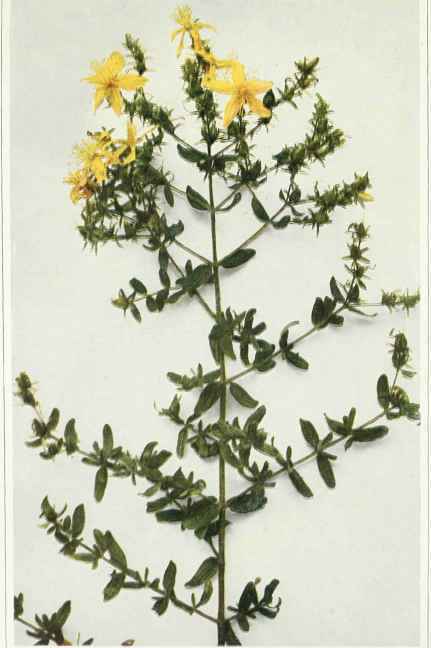 Leaves sessile, linear or oblong, one-half to 1 inch long, one-tenth to one-third of an inch wide, blunt, black dotted. Flowers three-fourths to 1 inch broad, bright yellow, several or many in terminal cymes; petals five, black dotted, longer than the lanceolate pointed sepals; stamens numerous, united by their base into three sets; styles three; fruit pod or capsule ovoid, about one-fourth of an inch long or less, three-celled. Native of Europe and naturalized as a weed in fields and waste places throughout the East.